Aloe Vera is an incredible medicinal plant used for a host of purposes since the ancient Egyptians who called it the “the plant of immortality”. Aloe Vera is a thick, short-stemmed plant that belongs to the cactus family, and grows in dry climates. 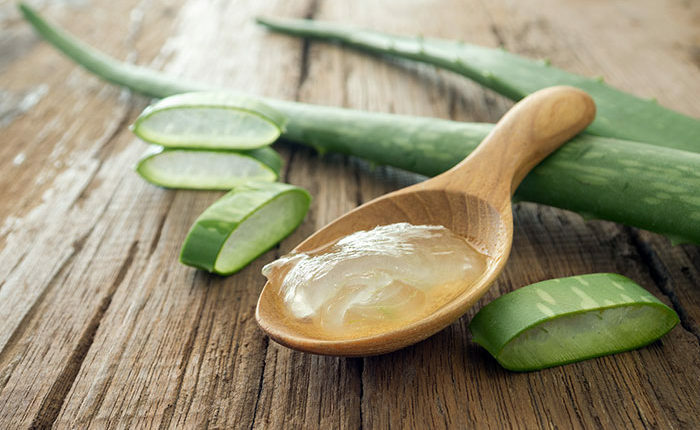 The leaves of the aloe plant are filled with a clear gel which has many medicinal benefits. Benefits of Aloe Vera: It contains over 200 active compounds including vitamins including A, C, E, B1, B2, B3(niacin), B6, folic acid and choline, minerals including calcium, magnesium, zinc, iron, selenium, iron, potassium, and others, 22 amino acids, antioxidants, enzymes, polysaccharides, and fatty acids which contribute to the beneficial effects of Aloe Vera. It is also an astringent causing contraction of body tissues and used to reduce bleeding from minor abrasions. Aloe is also an emollient, helping to soften and soothe skin, supplies oxygen and induces improved blood flow, increases the strength and synthesis of skin tissue. It is useful in treating acne and acts as a moisturizer: aloe vera contend a hormone that reduce skin inflammation and prevents drying of skin and rejuvenates it due to its high water content. Has anti-aging effects and lessens visibility of stretch marks as it contains antioxidants which improve the skin’s natural firmness as it fights with the free radicals. It accelerates the healing of mouth ulcers or canker sores and reduces the pain associated with it. Helpful in the treatment of gum diseases like gingivitis, periodontitis – reduces bleeding, inflammation and swelling of gums. It has powerful antiseptic and anti-fungal properties and can be used as a regular mouthwash. Aloe soothes and cleanses the digestive tract, improving digestion as it is an adaptogen which helps relieve either constipation or diarrhea. It’s a great remedy for irritable bowel syndrome as well as acid reflux. It is also a vermifuge; which means it helps to rid the body of intestinal worms. It is an effective detoxification agent absorbing toxins and eliminating them from the body. Aloe alkalizes the body and disease causing agents cannot manifest in an alkaline environment. It is also antipyretic which means it reduces or prevents fever. Regulates blood pressure, improves circulation and oxidation of blood lowering cholesterol and risk of heart disease helping you to avoid complications and lead a healthy life. Caution: The aloe’s plant gel which is the innermost layer of each leaf is the beneficial part of the plant to consume but the skin and the yellow layer directly under the skin, called latex, is considered unsafe. It is dangerous for pregnant and breast-feeding women as it has been associated with birth defects and miscarriages. It has also been linked to kidney problems and liver injury, hence must not be consumed regularly even for its health benefits.